The New York cruise port is a spectacular complex that actually accommodates two distinct departure points, one in Manhattan and the other in Brooklyn. The Manhattan terminal, home to the Carnival cruises from New York and the majority of other lines’ offerings too, is one of the most modern terminals in the country. It recently underwent major upgrades in order to better handle the bigger ships that are sailing the oceans today. The Brooklyn terminal currently handles passengers on any of the Cunard lines’ ships at their new complex that opened in April of 2006. The sophisticated gangways, spacious areas to park and efficient transfer from land to sea all make this port a great getaway for your next cruise vacation. Parking is always a major concern, and at New York cruise port, the amenities are spacious and monitored, not to mention easy to access both before and after your cruise. Prices for parking are $35 per night from 1-10 nights at the Manhattan complex (for cruises 11-30 days in duration there is a $350 flat fee) and $23 for the first 24 hour period over at the Brooklyn port. Each additional day in Brooklyn runs you $20. Cruises from New York to Canada are always popular choices with many people deciding to spend a few days before or after to explore New York itself. There are a plethora of hotels in downtown NY and some, like the Ramada Staten Island, the Best Western Prospect Park and the Best Western Gregory Hotel are all within 5 miles of the ports. With such close proximity it is a great idea to leave the car at the hotel and yellow cab it to the port. Parking at the Best Western Prospect Park is only $18 a day, far cheaper than the rates at New York cruise port itself. 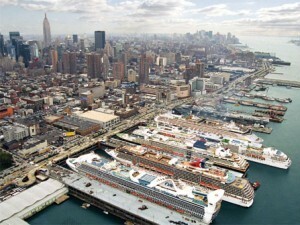 Norwegian, Carnival, Princess and many other lines depart New York for destinations around the world. If you are looking for something a little closer to home, there are fabulous 3-day cruises from New York where you simply float around in the Atlantic Ocean and for two nights get to explore amazing ships from Carnival and Norwegian. Fine dining, the casino, the spa, the activities, and all without having to disembark for any ports of call is what these mini escapes from the big city offer. When in town, why not check out a New York dinner cruise? Not only do you garner the best views of the towering skyline, but you can dine under the stars beside one of the world’s most famous cities. With so many activities in and near the New York cruise port, you will never be at a loss for something to entertain you and the family before or after your cruise vacation.